Most Americans spend a great deal of their time each day–approximately 8-9 hours–sitting. This is primarily due to the fact that the majority of employed individuals work desk jobs that require a seated position. This type of lifestyle, in which a person sits for large portions of the day, is called sedentary behavior. Numerous studies have shown that sedentary behavior is associated with several negative effects on health, including obesity, heart disease, diabetes, and cancer. This may even be true for individuals who are physically active and meet the recommended guidelines. One particular group of workers who are affected by sedentary behavior is call center operators, who spend about 90-95% of their work shift in their seats. As a result of the recognized dangers of sitting, the use of standing desks has been introduced to some offices. Standing desks have been received well and have been found to reduce discomfort and improve work efficiency. For this reason, a new study was conducted to determine the effects of stand-capable workstations on work productivity in a call-center over six months. A stand-capable workstation means that the height of the desks could be adjusted. A total of 167 employees in a call center who provided health and clinical advising over the phone served as the study group. These employees were split into two groups: one group of 74 workers would use stand-capable desks, while the other 93 were to use standard seated desks. The stand-capable desks used were either sit-to-stand or stand-biased. 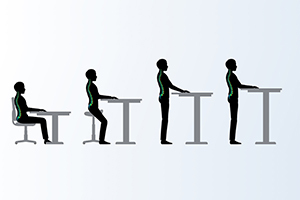 Sit-to-stand desks could switch from a sitting mode to a standing mode, while the stand-biased desks could be adjusted to different heights, and when low enough, the user could sit at them on a high stool. These two groups then used their desks for six months, and data on their work productivity was collected from them on a daily basis. Results showed that workers using the stand-capable desks were more productive than those who were using the standard seated desks. On average, the stand-capable workers had 0.5 more successful calls per hour than seated workers over the entire span of the study, especially the final five months. The productivity of the stand-capable workers increased from about 23% in the first month to 53% over the next six months, and these workers were found to be about 45% more productive overall than seated workers. Although it's not entirely clear why the stand-capable desks led to an increase in worker productivity, it's possible that it may be due to less body discomfort, better functioning or a combination of these factors. Other studies have identified these positive effects of stand-capable desks, and additional studies will help to better understand it. On the whole, this current study shows that using a stand-capable desk can increase the productivity of workers by getting them to sit for less of the day. Future research should continue to look into this matter further while other efforts push to introduce these types of desks in more workplaces.